I swung my feet, careful not to kick the pew in front of me, which I knew would get me a look (you know that look) from my mom. The sister on my left was sitting on the floor, using the seat of the pew as a desk, as she carefully colored in Father Abraham's sandals a shade of puke green. I sighed heavily and picked up my Adventure Bible, flipping through it to the beginning of the chapter the pastor was preaching on. Lists of names that I couldn't even begin to try to pronounce- how boring! Who cares who begot whom? I felt my eyes glazing over... rescued only by my mom passing the traditional mid-church-peppermints down the aisle. Honestly, most people feel a little like my ten-year-old self when they get to lineages in the Word. I still do, sometimes. Why does it matter, anyway? I mean, all those names just run together, and the Bible doesn't even share the stories of everyone whose name ends up on one of those lists. I'll admit, most of the time, I skip past 'em and head to the stuff that "matters." Lineages, while pretty boring at first glance, tell us a lot about the Bible, actually. They're used in several different ways in Scripture, and when we remember why lineages are included and how they're used, we can find even more layers of meaning in the Word of God. 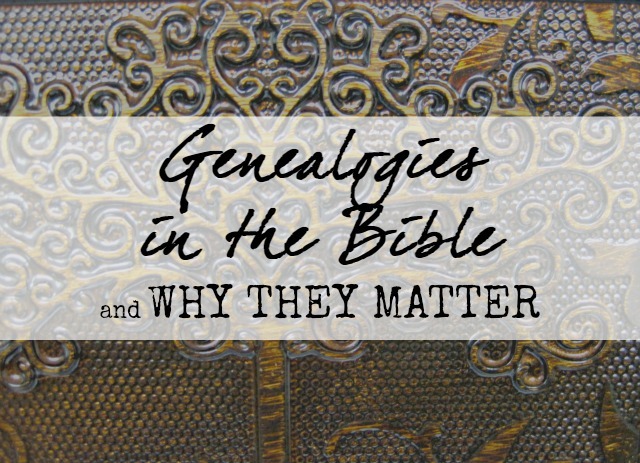 Biblical genealogies really do, matter- and here's why. The first way that we see lineages used in Scripture is as markers. Lineages divide sections of Scripture, beginning new "chapters" with different themes. In early Genesis, genealogies are used in this way. If you're reading in the NIV, the translation says, "the account of" or, "the written account of." Same difference. The author of Genesis (Moses), inspired by God, uses that term to help us switch gears mentally. So, for example, in Genesis 6:1, we've been talking about Adam and Eve, so far, but the genealogy tells us that we're switching gears- we're transitioning from Adam's story to Noah's story. Genesis 10:1 - the genealogy helps us make the shift from Noah's story to Shem's. And so it goes. In middle school English class, we were taught to use transition sentences in our paragraphs- and just like a good writer, Moses does this, too- and it can help us to recognize a change in topic. Think of it as a fast forward of sorts- but don't gloss over them. Pay attention... because these fast forwards have some other really great stuff in them, too. One reason to pay close attention to the genealogies in the Bible is that they explain a lot of other stuff that goes on in the narrative of Scripture. Ever wondered why the poor Canaanites were driven out of the Promised Land by the nation of Israel? A genealogy tells us why. Let's stay in Genesis for this example, shall we? After the Flood, Noah gets off the ark with his wife, his three sons, and their families. His sons names are Ham (who is a dad- he has a son named Canaan), Shem, and Japheth. In Genesis 9, we read a kind of... um... uncomfortable story about Noah's family life (you can read it here, if you'd like). Basically, one of Noah's sons treat him dishonorably, and two treat him with the respect a father deserves. Read the lineage of Canaan in Genesis 10, and you'll see that the descendants of Ham's son Canaan are the Canaanites, and the other tribes that came from the same family (like Hittites, Philistines, Amorites...). They aren't very good people. Pretty evil, actually. If any of those names look at all familiar, it's because you've seen them later on in the Bible. The names of these tribes are all over the battle scenes in the Old Testament- because they're the tribes at war with the Israelites- the descendants of Shem. Family history matters- and can help us figure out why other things are going on in Scripture. Sometimes it can feel like Jesus coming to earth was God winging it. Like we got to a certain part of history and God thought, "Hey, I'll send my Son to save them... they're a mess." God had a plan for our redemption in mind from the very beginning. We see that God makes covenants with Abraham, and with Abraham's grandson, Jacob- that from their lines, from their descendants, will come the greatest blessing for the whole earth. Generations later, David (a great-great-great ...and so on... grandson of Jacob), receives a similar promise- that from his line, a Son will come to establish an eternal kingdom. And then in Matthew, we see the geneology leading from David to Jesus Christ himself. It all fits together! a direct descendant of them all- part of their family tree- Jesus Christ himself. God had a plan all along- He fulfilled His promises to humanity and brought His salvation at the same time. Sometimes, I find myself thinking that God can't possibly use me for anything important. I'm broken, messy, selfish. My family background is nothing special. My faith journey isn't dramatic. I'm just plain, simple, me. But reading genealogies tells me that I'm totally mistaken in that line of thinking. Let's look more deeply into Jesus's lineage in Matthew. (Read the whole thing here). Something to remember about the lineages in the Bible: women are mentioned sometimes, but usually when a woman is mentioned, that is a big arrow pointing to something important that the author (through the inspiration of God Himself) wants to say. Big, flashing arrows in the genealogy of Jesus? The women that Matthew points out, the women who Jesus descended from, are broken, messy, plain old people. If God could use these women to bring His Son into the world, can't He also use my small, messy, broken life? Genealogies and lineages in the Bible may seem, well, mind-numbingly dull. But when we read them with the perspective that they're in the Word for a reason, we can really unlock a lot of the richness that's there, just beyond all the funny-sounding names. What is the purpose of this genealogy? Is it being used as a transition? Proof of someone's true identity? A fulfillment of a promise? Why is this genealogy included where it is? Do I recognize any of these names- of people or of tribes? How can this help me understand other parts of Scripture? Who are these people, really? What can this lineage tell me about their family history or their view of the world? There are gems to be found, even in the seemingly boring parts of Scripture. Genealogies are rich with great stuff- we just have to take the time to dig in, pay attention, and ask questions. I've always had a hard time reading over the lists of names. Then I realized that they were important or God would not have had them listed. "All scripture is God-breathed..." so I try to learn from them instead of passing over them like I normally do. Enjoyed this! That's very true-- all Scripture. Even the parts that don't seem to matter, even the hard parts and the crazy names. Thank you for stopping by, Mindy! Ally, I really like your writing. I learn something new every time. I lead a FB group that reads through the Bible chronologically every year. I'm going to share this piece with them. They suffer through these lists several times throughout :) I advise them to 1) Read out loud. 2) Look for any names that are familiar. 3) Watch for fun facts such as a daughter getting a rare mention or someone being left handed or some other point of interest. I might have to join that group! Sounds like fun! Love this reminder! Every word is important. All of them. it is hard to read through them sometimes but it matters. I'll be honest, I struggle with genealogies and other "boring" parts of Scripture that feel inaccessible or difficult to find a personal application. I *know* that every part of God's Word is purposeful...but sometimes the purpose is lost on me. Thank you for this encouraging and practical breakdown of how to approach these unapproachable sections! I bookmarked this post so the next time I come upon a genealogy I can revisit your wise tools. So glad to be your neighbor at #TellHisStory. I'm so glad I'm not the only one who wrestles with this sometimes! Yes, I've come to love reading the biblical genealogies. Sometimes I discover a little tid-bit I hadn't noticed before, like your example of the Caananites. And I love how Matthew opens with the genealogy of Jesus...showing from the beginning how Jesus' birth fulfilled the messianic prophecies. Thank you for discussing this oft-overlooked topic! Isn't that beautiful? It's just amazing to see how God fulfills His promises- what an encouragement! This is a wonderful explanation of why "those" lists of names are important. I really love how he shows us his faithful plan!!!!! Thanks for sharing at #lifeislovely! Thank you for hosting! And yes, isn't it incredible to see His plan moving, even when we couldn't possibly understand it? It gives me hope for the ways His plan is working in my life, even when I don't see it.